Why use expensive wallpaper when you can simply stencil your walls with this classic Duchess Damask! This classy stencil pattern features vases with flowers and elegant pearls. Reusable stencils save you money and make you feel proud of your creation. 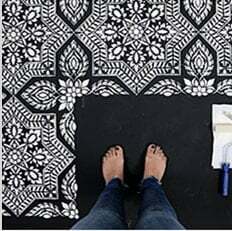 This elegant allover pattern is perfect for DIY decor. Damask stencil patterns bring stylish elegance to any room. Great for classical decor but will work in the contemporary setting too. This design will look stunning stenciled on your accent wall or above the chair rail. Easy registration system, simply line up your stencil with the leaf design of previously painted print, check for level and continue. This gives you a seamless "wallpaper" look. While prior stenciling experience is recommended for allover patterns, even beginner stencilers get great results! This design is recommended for feature/accent wall and entire room and also works for furniture and fabric embellishment.